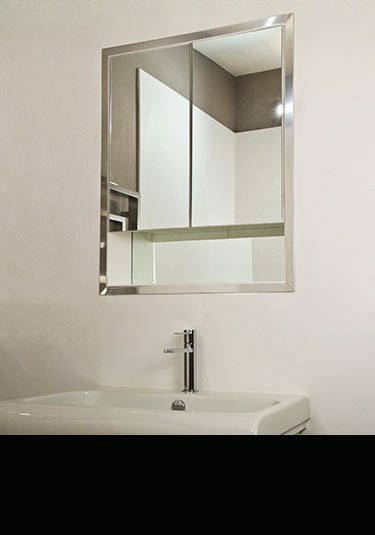 This bathroom mirror cabinet is designed for recessed installation within a bathroom wall. Available as a single or double cabinet with a choice of black or white painted finish and with or without LED low energy lights. 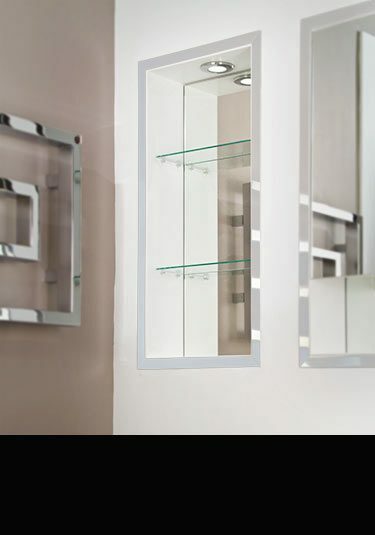 Each countersunk bathroom cabinet has a stainless steel surround frame, glass shelves and is mirror backed. This open shelf unit is designed for recessed installation within a bathroom wall. Available with or without LED low energy lights and in a white or black painted finish. Each countersunk bathroom shelving unit has a stainless steel surround frame, glass shelves and is mirror backed. A high quality aluminium bathroom cabinet that is designed for recessing into the wall. This contemporary styled cabinet has 2 strip light which are sensor activated and a shaver socket. Livinghouse supplies a quality range of recessed bathroom cabinets and built in open shelving units. These built into the wall cabinets are ideal for space saving by using the stud wall voids that are in many cases already within the property, but are un-used. With the trend for wall hung bathrooms and in wall toilet cisterns our recessed cabinets are the obvious design choice to match this contemporary flush installation theme. 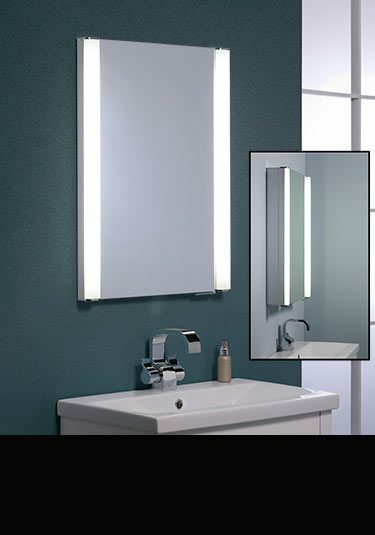 These sunken bathroom wall cabinets are supplied with or without lights in black, white or aluminium carcasses and can be supplied with or without shaver sockets.